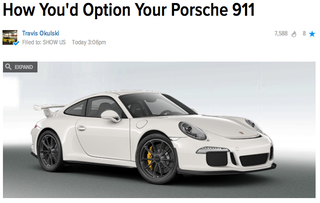 Travis' post, How You'd Option Your Porsche 911 killed my afternoon productivity yesterday but that's fine because it's always fun to be spec'ing out a car you can't possibly afford instead of doing work that could make you money that you could then save up to purchase said vehicle. Anyway, if you're like me the article probably sent you down a rabbit hole, building many different 911's. What I'm wondering is if anyone else approaches these builds the way I do, by season. Yes, I live in Southern California where there are no seasons, just a time of year when it's slightly less nice and it might rain once or twice. However I grew up in Vermont, where if you don't like the weather, all you have to do is wait 10 minutes and it'll be different. With that in mind, I like to think about what kind of aesthetic qualities I'd want in a car based on the vibe of the four seasons. For the purposes of keeping this simple I'm limiting this to 911's because opening it up to different models, let alone different manufacturers is just more than I can process right now. Perhaps in the future that's a post I'll do, the best vehicles for every season. Leave your builds in the comments with an options list and why that build relates to the season. It's cool if you only want to do a season or two, I get it, not everyone has the time/creativity to build four very different 911's. I've posted the visual options, all the other options I selected are shown via the link to the configurator. Hope this inspires some people to get in their heads and ask themselves the tough questions like "should I match the seat belts to the brake calipers?!" and "Can wrap the exhaust tips in leather?". I only have one question and it's for Porsche, why is there no dark green metallic paint option?! Carrera Turbo S Convertible: White Metallic over Yachting Blue, seat belts & gauges in Racing Yellow, Guards Red sport chrono clock, Alcantara sport steering wheel/gear selector, brushed aluminum interior accents, carbon fiber door sills. Carrera Targa 4S: Anthracite Brown Metallic over Espresso/Cognac natural leather, gauges, seat belts & sport chrono clock in Luxor Beige, Mahogany interior package. Winter: "Frosty The Go Man"
Carrera 4S: GT Silver Metallic over Garnet Red natural leather, gauges & sport chrono clock in white, Silver Grey seatbelts, Mahagony Package, heated Mahagony teering wheel, stainless steel illuminated door sills.